New program in 2019! Can you guess what it will be? - Read More → . . . . .
Healthcare careers are booming! - Read More → . . . . .
RMCTC has a career for you. - Read More → . . . . .
RMCTC's Technical Academy - Read More → . 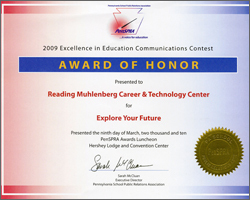 . . . .
RMCTC is proud to be recognized within the Career & Technical Education community for many achievements. Below are some of the certificates of achievement the School has recently received. 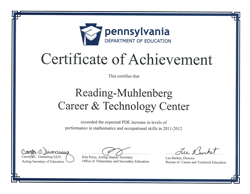 Presented to RMCTC by the Pennsylvania Department of Education for exceeding expectations of performance in mathematics and occupational skills. Awarded by the Pennsylvania Department of Education to RMCTC for school-wide student performance on NOCTI assessments. 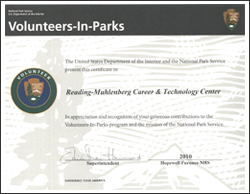 Awarded to RMCTC by the US Department of the Interior and the National Park Service for our generous contributions. Awarded to RMCTC for efforts and commitment to honoring our armed forces personnel. Presented to RMCTC in recognition of their professional memberships in PA Association for Career & Technical Education and the Association for Career & Technical Education. 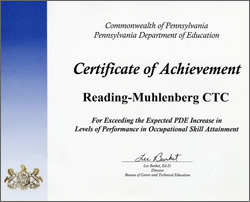 Received from the Bureau of Career & Technical Education for having the second highest increase of NOCTI scores in Pennsylvania for 2009. Awarded for excellence in educational communication for the 2009 Open House/Post Secondary Night invitation designed by the Advertising Design & Commercial Arts students. 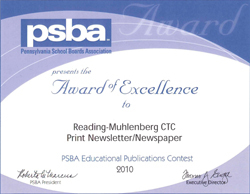 Awarded to RMCTC by the Pennsylvania School Boards Association for excellence of our Newsletter, TechTalk. 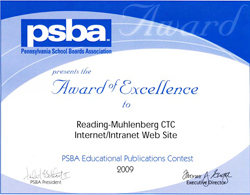 Awarded by the Pennsylvania School Boards Association for excellence of our Web Site. Download an application for enrollment. in its educational and vocational programs, activities, or employment as required by Title IX, Section 504 and Title VI.